Directions: As part of the Less Tears More Years Act, all applicants who are under 25 years of age is required to take a driver education course to apply for a driver license. Upon successful completion of the course, the person is required to take the knowledge test, also known as the written test. You need a grade of 70 percent or better to pass the knowledge test. Have done as much as you can. Must stay until the police arrive. Must leave a written notice containing your name, your address, and the circumstances of the accident. May go on your way. Upon striking an unattended vehicle, stop and try to locate the owner. If you cannot find the owner, leave a written notice containing your name, your address, and the circumstances of the accident. What should you do if your vehicle’s right wheels leave the pavement? Immediately pull all the way off of the road and get back on when it is safe. Accelerate and steer back on the road quickly. Take your foot off the accelerator, slow down, then ease back onto the road when it is safe to do so. If your vehicle’s right wheels leave the pavement, don't panic. Take your foot off the accelerator and steer parallel to the road. Slow down and ease back onto the roadway by keeping both hands on the steering wheel and steering into the road’s right lane with a small turn of the steering wheel. Check for traffic around you before steering back onto the pavement. Disregard the signal if there are other lanes available for the emergency vehicle. Stop as quickly as you can. Slow down, move your vehicle to provide a clear path for the emergency vehicle, and stop. Increase your speed to get out of the way of the emergency vehicle. If you hear the siren or see the flashing lights of an emergency vehicle, you must slow down, provide a clear path for the vehicle, and stop. Don't try to outdrive the emergency vehicle. 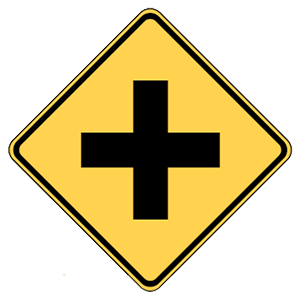 This sign indicates that an intersection with a crossing road is ahead. You must come to a complete stop. Drive with caution and be ready to stop. 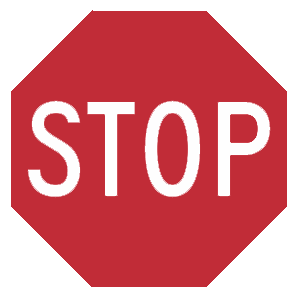 An eight-sided sign always means "stop." You must come to a complete stop and wait for any vehicles or pedestrians to clear the way before proceeding. The road ahead winds a series of turns or curves. This sign warns that pavement is slippery when wet. In wet conditions, you should reduce your speed, avoid braking or changing direction suddenly, and increase the distance between your vehicle and the one ahead.